Troubleshooting reference for resolving issues with DataStax agents. Use this troubleshooting reference for resolving issues with DataStax agents. 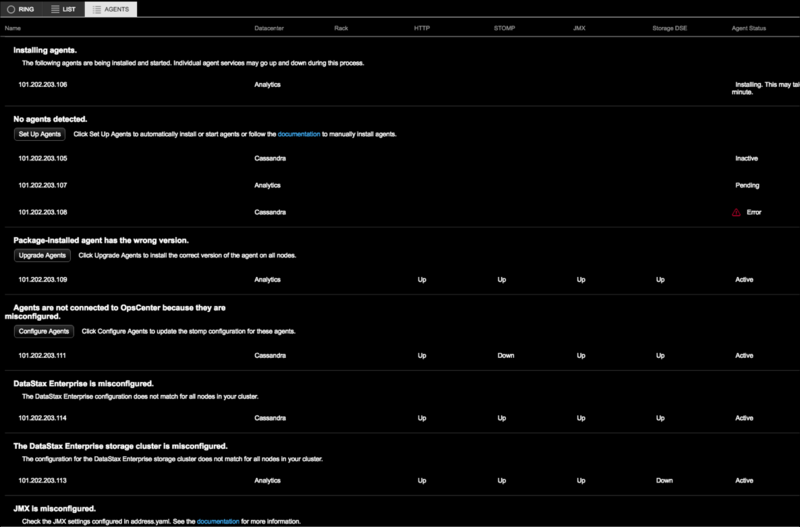 The issues appear in the Agents View along with troubleshooting tips, links to documentation, and links to the Install Agents dialog. No agents detected. The agents are not installed. Click Set Up Agents to automatically install or start agents, or follow the documentation to manually install agents. Agents are not connected to OpsCenter because they are misconfigured. Click Configure Agents to update the stomp configuration for the misconfigured agents. Package-installed agent has the wrong version. The agent version installed for a package installation type does not match the currently installed agent version in OpsCenter. Click Upgrade Agents to install the correct version of the agent on all nodes. Tar-installed agent has the wrong version. The agent version being attempted to install for a tarball installation type does not match the currently installed agent version in OpsCenter. Tarball agent installs cannot be automatically upgraded. See the Upgrade Guide to upgrade the current version of OpsCenter. The DataStax Enterprise cluster being monitored is misconfigured. The DataStax Enterprise configuration does not match for all nodes in your cluster. No HTTP communication to the agent. OpsCenter cannot talk to these agents over HTTP. Check that the OpsCenter machine can reach these agents via HTTP and check that SSL is correctly enabled or disabled in both OpsCenter and agent configurations. See Configuring SSL for more information. The DataStax Enterprise storage cluster is misconfigured. The configuration for the DataStax Enterprise storage cluster does not match for all nodes in your cluster. See Storing collection data on a separate cluster and ensure the storage cluster is properly configured. Node down. The agent has confirmed that a node is down and requires investigation into the root cause. In addition to showing a node down in the Agents and Ring views, you can add an alert for nodes marked as down and configure alert notification using email or POSTing to a URL. Either update the configuration in the OpsCenter Connection Settings > Edit Cluster dialog if all nodes have this error or check the node-specific JMX config if this is an issue on a subset of nodes. The agent is unable to connect to JMX and is using advanced JMX settings configured inaddress.yaml. Check and update the settings on the node.